Natterjacks and VetPartners – a tail of success! Natterjacks and VetPartners – a wagging tail of success! Natterjacks celebrated its first year with VetPartners at the end of 2018 – and what a breathtaking year it was. We installed some amazing new facilities, added some fabulous new faces to the team and hatched some exciting plans for the future. But who are VetPartners? What do they do for us – and, more importantly, you and your pet? To keep you in the picture, here’s a brief summary of how it was then, how it is now and how we intend to keep us all on an incredible journey onwards and upwards together ;-)! 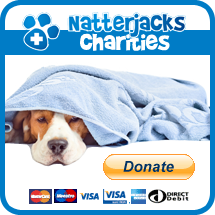 Natterjacks Vet was established in 2012 as a family-run, community-focused facility to provide the local area with a genuinely new and better option for the beloved four-pawed members of the family. Offering a unique blend of affordability, top quality care, cutting edge facilities and a highly personal service, Natterjacks became one of the fastest growing practices in the UK. Based on reputation and recommendation, people flocked from miles around in the hope that their pets too could benefit from the efforts of our skilled and famously friendly team. In 2016, we were thrilled to open the doors of our second practice, at Darby’s corner in Poole, to help us cope with the demands of our growing family and extend our offerings to an even wider audience. As the practice has grown in size, its reputation as an advanced clinic offering a range of specialist procedures has also grown. Increasingly, patients have been referred from neighbouring practices knowing that our additional expertise could provide vital assistance without the hassle and additional expense of more distant specialist referral centres. However with resources already stretched, this growing demand and expectation as well as the continued aspirations of our ambitious team meant that we were struggling to keep up with the pace of progress. Staff found themselves overworked, costs were rising and there was little or no management infrastructure – we were creaking at the seams and it was starting to become a problem. A problem of our own making and a good problem to have, but a problem nonetheless! We were therefore delighted in late 2017 to team up with VetPartners. VetPartners were established by vets in 2015 to provide financial and logistical support to practices just like ours to help them overcome growing pains and take their practice to the next level. With VetPartners help, our Bournemouth surgery has been treated to a £40k overhaul of the clinical areas as well the creation of a new dental suite and small treatment room in early 2018. Poole received a new state of the art £25k ultrasound scanner at Easter of the same year. Further investment in Bournemouth followed with the installation of a new video-endoscopy suite costing some £30k at the end of 2018. And at the end of 2018, work started on the area’s first CT scanner at our Poole branch – firmly cementing our position as the most technologically advanced and well-equipped practice in all of Bournemouth, Poole and Christchurch. With planning permission granted for a bold extension to our Bournemouth branch, and formative plans for a new Christchurch branch in the coming year, the future for the practice alongside our new partners looks brighter and brighter. Natterjacks founder Andy Matthew still owns both sites and remains involved with the practice on a daily basis with a dual role as a consultant to the practice, advising on development and management, as well as keeping his hands dirty with a busy caseload of advanced orthopaedic surgery. Whilst you will not see Andy in the consulting room as much for day to day veterinary matters due to his commitment to the latter, rest assured that he is still very much present to help when it really matters ;-). Indeed, having started as a one-man band with only a limited offering, we are now extremely proud to boast the many virtues of our large team of exceptional vets and nurses who between them are able to expertly deal with every issue that your beloved pet may ever encounter in its lifetime. Despite the pace of our growth, our team remains uniquely close-knit. We liaise closely on each and every patient so that you can be sure that whoever you see you will be benefiting from the combined skills of a truly remarkable group of people. Q: I see new faces at the surgery at times. Has Andy or anyone else left? A: No – we have all the same staff with a few new faces to cope with growth and strengthen certain areas – we may even have someone free to answer the phone now! The senior members of the team have not changed since day one. Our staff rarely leave – once a Natterjacker always a Natterjacker! Q: Can I still request to see a specific vet? A: Yes, absolutely – you can see whichever vet you prefer though certain vets are only seeing cases relevant to their specialisation. Q: Are Natterjacks still taking new patients? A: Yes – contrary to some rumours we have not closed our books and are investing heavily to increase capacity and improve service to existing patients. Q: I watch Supervet on TV. Are Natterjacks able to perform these procedures? A: With our new facilities and specialist offerings, much of what you see on TV (and more!) is now easily within the realms of our work – please enquire for more info. Q: I would like a referral to Natterjacks or to join the practice – do I need a referral from my vet? A: No. Anyone can join whether you simply want to vaccinate your new puppy or kitten, arrange neutering etc or seek an advanced referral for ultrasound, endoscopy, CT scans, orthopaedic surgery etc. You can do so directly via phone, email or through our online registration form here – we can obtain any medical notes from your vet though you may need to give consent for us to do this.